CTC Disability Services (formerly CROSB) is part of South Burnett CTC Inc (CTC), a community organisation that provides a range of services and supports to families and individuals across the South Burnett region. CTC Disability Services offers the benefit of over 5 years of experience in providing a variety of support and activities to individuals, their families and carers. CTC Disability Services was established as CROSB (Community Respite Options South Burnett) by an active group of families of people with a disability in 2002. They were seeking alternatives to support options traditionally available in the South Burnett region and were successful in establishing a small respite service based in Kingaroy. South Burnett CTC Inc (CTC) has acted as the auspice and managed the service ever since, actively seeking the input and feedback of people with a disability who use our services, families and other supporters, to steadily grow. CTC Disability Services provides a range of in-home and other community based services which are tailored to the preferences and needs of the people who use our services. Our aim is to provide support which promotes quality of life through community belonging and participation, independence and meaningful social roles. 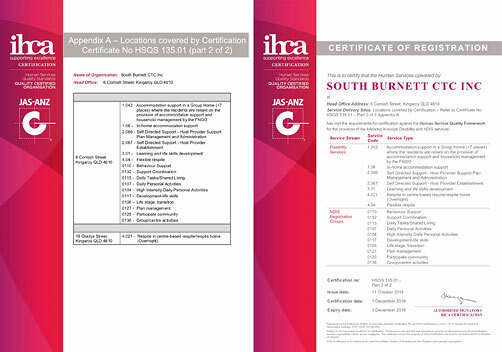 South Burnett CTC is a registered NDIS provider for 18 registration groups.